Today the lovely Angela is challenging us to make something using our favourite technique. Now if you are anything like me I took one look at that and thought where do I start? I love so many techniques. Shall I write them all out and pull one out of a hat? No not really. But I decided that although I use blend and flick and masking alot with DIs and sprays I decided to go with a favourite that I don't use so often and that is T!m's Rusted Enamel technique. So here is my Stamp Man DT piece, I hope you like it. If you want to see how to do this technique in more detail it is in the Compendium of Curiosities Volume 1. We look forward to you joining is at The Stamp Man and if you do you will be in with a chance of winning a £10 voucher to the On-line store. Have a wonderful Friday and a great weekend. Your tag is gorgeous, Brenda. I love that butterfly and your background is beautiful. I must check it out in C of C. I think I've either missed it or forgotten it!!! Don't give me another favourite!!! Thanks so much for your lovely comment, you are very good for the soul!! Sorry Brenda, you'll think I've gone completely loopy. It was another Brenda who left the comment!!!! Beautiful tag Brenda! Love the rich look of the background too. Another fabulous tag from you Brenda - why do I keep forgetting that I have a whole batch of these tags!!! Beautiful background brenda, and a great collection of images and techniques. Really gorgeous tag Brenda and love the rusted enamel background - fab colours. Beautiful images and embellishing too. A beautiful tag Brenda. I love the rusted enamel technique too!! That's what's so good about this craft, just so many great techniques to use. Thanks for all your lovely comments on my blog. I am always amazed at how you manage to get around so many!! Hi Brenda, this is fab. I really am going to have to get hold of Tim's Compendiums aren't I !! Marvellous tag, Brenda...that butterfly is so gorgeous...wishing you a wonderful weekend! gorgeous tag! Have a nice weekend! A fantastic background technique, your tag looks beautiful. Stunning Brenda, I love the colours used and that butterfly is so gorgeous ! Hugs G.
Brenda I love your background! Beautifully fun tag! This is really lovely Brenda. The butterfly is gorgeous and I love the fabulous background, the colour is really pretty. I must find/make time to revisit my first Compendium book and see which other techniques I've completely forgotten about because I'd forgotten this one. Thank you for joining in the Snazzy DT Blog challenge and good luck. The tag is so beautiful, dear Brenda! I think very original is the idea with the pen as a butterfly body. Very creative my dear! How beautiful, Brenda! 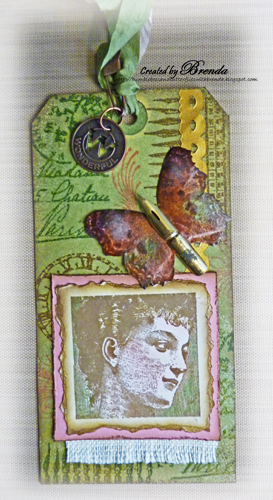 Love your stamping and all those layers.... the butterfly is fantastic!